The account of Mayla walking up to the altar to pray and then getting baptized right on the spot, with all the stunned congregation staring at her, is hilarious. No less funny are Mayla’s attempts to fit in, make friends, and find herself a ministry in her new church. But the novel is not all comedy. As Mayla makes her first steps as a Christian, she agrees to visiting a young man in a hospital, a friend’s friend. though is that the man is dying of AIDS. Mayla is not prepared for what she sees; she is shocked to see Alex, a live skeleton with no hair left and nasty wounds on his skin. started as a “Christian good deed” turns into a strong friendship. I highly recommend this book to every chicklit fan, Christian or not. 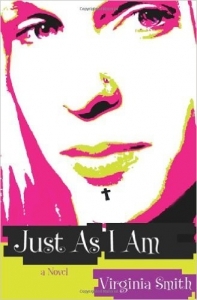 The novel is not preachy despite the fact that it is about conversion, church and other things like that; it is honest, well-written, and insightful.